I'm not Japanese but the Japanese in Hawaii take New Year's seriously. They are dignified about it, unlike some cultures which get drunk, wasted and hung over - although heck, maybe there are plenty of Japanese who do that too! It's customary to clean house for New Year's and place the kadomatsu at the entrance of one's home or business to welcome the new year. The kadomatsu is an arrangement of bamboo, cut at an angle, and pine sprigs, which symbolize strength, long life, flexibility, and growth. I like to think of this decoration as the equivalent of the more common holiday wreath. Kadomatsu is not usually available in local supermarkets, although Times is a supermarket with more of a local Maui base, as compared to say, Safeway which is more "white bread" and part of a large mainland supermarket chain. No offense intended - I shop at various places. Usually kadomatsu can be obtained from one's local hongwanji or Japanese temple. The Japanese also traditionally pound mochi as part of the New Year's celebration. Mochi is a sticky sweet rice that is pounded until it becomes soft and malleable. Often, a sweet filling is placed inside. Mochi is widely available all over Hawaii, not just for New Year's. sweet azuki (red bean) paste. Next year, if there's time and I'm not going crazy, the Japanese Cultural Society arranges a mochi-making and kadomatsu-making evening, open to the public. Add that to the list for next year. I found this video on kadomatsu making which also looked pretty interesting. Fireworks on sale, locals go crazy buying them. It's the time of the year when the supermarkets, yes, even the supermarkets start selling fireworks, and advertising prices in their newspaper fliers. Apparently Oahu has banned specialty fireworks, but Maui has not and sales of Maui fireworks are up. this one is even called Hawaiian Jumping Jack. DH and I stopped at Long's Drugstore (now part of CVS) the other night, and I was surprised by how many fireworks they had on sale. At least one full aisle, both sides of it, and a display in the middle of the store, where Longs has their sale items. 2 full aisles of fireworks for sale. Maui is not as fireworks crazy as the Oahu that I remember growing up. Driving back on the way from Aloha Tower to central Oahu, the highway was invisible, because there was so much smoke in the air from all the fireworks. It was like driving through a can of vaporized cream of mushroom soup. Everything was white, soft, and milky. The stretch through Pearl City was especially bad. The next morning, shreds of bright red paper littered the ground, from all the fireworks wrappers, like rose petals lining the sidewalks and driveways. Maui so far is not that smoky - we don't have that kind of population density, but it will be pretty busy and noisy. Happy New Year! A Norfolk pine Christmas tree replete with beer bottles and thingamabobs. Yes, I know Christmas is over. I also have just managed to get back to the Hali'imale Community Garden yesterday, after weeks of rain in Ha'iku. On the way to the garden, I saw this Norfolk pine outside of Dingking, and burst out laughing. It's decorated in the redneck style, with mysterious car or electronic parts, and plenty of beer bottles. It even has a Home Depot bucket. Classic. By the way, Norfolk pines do grow on Maui and the other Hawaiian islands. They can be decorated as Christmas trees or grown in pots as living Christmas trees and then planted outside. I did have a Norfolk pine Christmas tree one December, about 10 years ago on Kauai. All the regular imported Christmas trees were sold out by the second week of December. So we got a local Christmas tree. Norfolk pines just aren't my first choice. They look pretty growing outside but look like Charlie Brown Christmas trees once they're brought inside and decorated. On the plus side, they are environmentally friendly, inexpensive, and you can even grow them yourself. Next year, maybe DH and I will splurge for a Maui grown Christmas tree. It would be far more sustainable and environmentally conscious. Kula Botanical Gardens has a Christmas tree sale every December, with locally grown Monterey pines. Ant exploring the sweet kiawe pod. Ouch! Kiawe, which we pronounce kee-ah-vay, is one of those trees that almost everyone knows about, even many tourists, because it hurts so much. It's the reason why Hawaiians started wearing shoes and long clothing, because the missionaries brought it over here as a tree of salvation. Or at least that's the story I learned here. Kiawe has many thorns, cleverly arranged so that when a branch falls down, at least one thorn will point upward. DH claims that kiawe was the inspiration for military tank traps - the spikes rotate along the branch. But is kiawe edible? Kiawe is apparently a variety of mesquite, and Wikipedia's entry on kiawe just confirmed that. My first inkling that mesquite is edible was from Gary Paul Nabhan's eloquent book, Coming Home to Eat, in which he discusses finding, harvesting, and eating edible wild foods in Arizona as well as his take on local food traditions. Nabhan praises the flavor of mesquite flour in tortillas. Kiawe wood is also excellent for grilling, but the wood is not edible. Inner kiawe pod encased in sticky sweetness. Fully exposed inner kiawe pod. With some effort, I cut into the inner pod with a knife, and found hard, glossy, little brownish seeds. I can't imagine collecting enough seeds to mill them into flour. Maybe if one has many menehune (folkloric Hawaiian brownies/elves) to do this tedious work. I'm wondering, did the native Americans of the Southwest mill the entire kiawe pods, or just the little seeds inside? Biting the seeds isn't recommended. Too hard on the teeth. Kiawe seeds inside the inner pod. I rinsed them off. I also experimented with toasting the other kiawe pods, and they were still difficult to open, and still sweetly gummy. Kiawe is an intriguing food, but until I figure out an easy way to harvest seeds or make kiawe flour, kiawe does not lend itself to my cooking experiments. At least the pods are not thorny. I bet it's gluten free too. If you have experience with kiawe as an edible food, please let me know! Update 11/8/12: Just found out about making mesquite or kiawe flour, so this may be my next cooking experiment. There are tons of kiawe pods in S. Kihei right now, so I'll try to collect some next time I'm down there. Every fall, East Maui Watershed Partnership organizes an art exhibit on native species at Viewpoints Gallery in Makawao. Native species. Not heliconia. Not coconuts. Not bird of paradise or most tropical flowers. Not any species introduced by Hawaiians or other cultures. Not species which snuck here on a boat, attached to a boat, or on an airplane. Species that developed here in Maui naturally or flew, swam, floated here on their own. For the purposes of this exhibit, Maui includes the outlying islands of Lana'i, Kaho'olawe, and Moloka'i. 1. 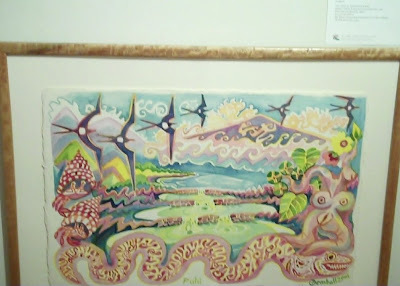 The art not only features native species of Maui Nui (like Maui County), but can also depict native landscapes and the people who are helping to preserve them. The species can live anywhere in the watershed, from the top of Haleakala to the reef. 2. This exhibit is a fundraiser that supports the East Maui Watershed Partnership, since 10% of any sold artwork goes to this organization, 45% to the artist and 45% to Viewpoints Gallery. 3. This exhibit also encourages participation by keiki (children), and there are categories just for children. Keiki art is also publicly exhibited, and has separate prizes. 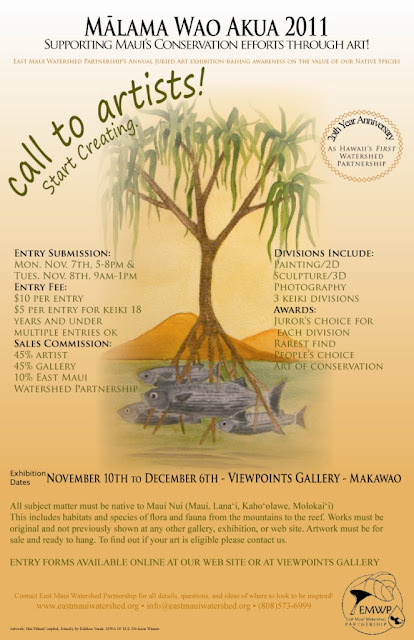 This year's call for entries. 4. The East Maui Watershed Partnership also organizes hikes through the watershed, especially Waikamoi Preserve, for artists and potential artists a few months before the exhibit deadline. Also, the Fleming Arboretum in Ulupalakua also hosts art tours through their native species gardens. To find out about either opportunity, make sure to sign up for the email lists with East Maui Watershed Partnership, Viewpoints Gallery, and Fleming Arboretum. The hikes and garden tours are a lot of fun, and I still have video from the Fleming Arboretum tour with Bob Dowdy that I haven't finished processing. The problem is that the video makes me extremely sea sick watching it - I swung the camera around way too much and don't know how to slow it down yet or extract the audio from the video. 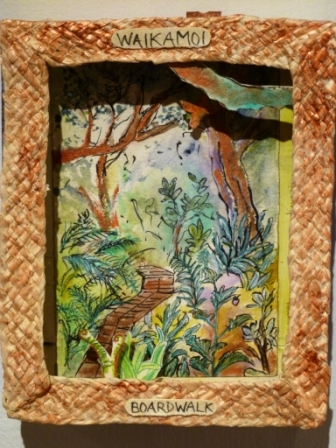 I didn't enter this year, for various reasons, although my entry last year was accepted - a whimsical pair of shadowboxes based on two hikes from last summer: the Bird Loop and the Board Walk. 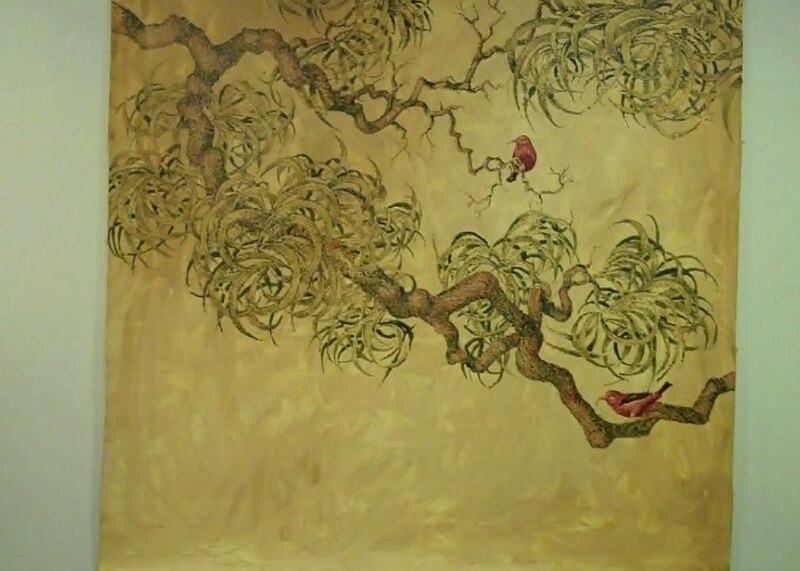 There are birds and plants which can move back and forth across the top or bottom. 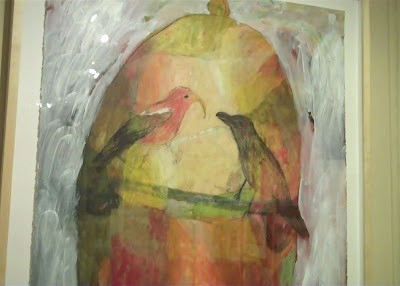 At the exhibit opening, this particular painting had a lot of us staring at it. It's like "Where's Waldo?" The trick is to find ALL the Hawaiian stilt birds, and the very last one took forever to find. Once you see it, it's obvious. If I could find them all again, I would circle them in red. Find all the Hawaiian stilts in this picture. 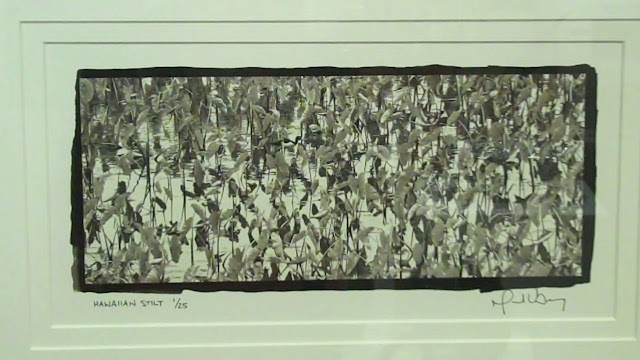 I also got back to the gallery just days before the exhibit closed, and took a few video clips. Here's the first one. 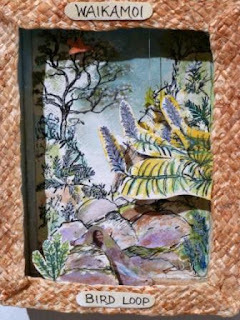 One of the other videos includes the keiki entries, and the other includes the wood sculptures and ceramics. I can't remember which one is which. Click on video 2 or video 3 to see them. Since the exhibit is open to anyone, and it can take a while to make artwork, get inspired for next year. If you are feeling craftsy and have lots of Christmas cards from the holidays, this is a very easy project to do. I am not doing a detailed instructional how-to post, although may consider updating this later. First, cut out a template for a 5 pointed star. Then cut out two stars from two different Christmas cards. It helps to make tabs for the stars so the edges can overlap. Glue the edges together. Don't get too crazy about matching the edges perfectly. Glue a cord at the top before gluing the second half of the ornament. Then glue glitter on the edges. The glitter can also hide any extra glue on the edges or mismatched edges. It's a fun project, but it makes a big mess - because glitter gets everywhere! but once the glitter is on, nobody will care. Santa Claus at Mama's Fish House. Christmas Eve Snowman, Makena State Park. Melting beach snowmen, Makena State Park. Inscribed stones at the Sacred Garden of Maliko. Inscribed glass pebbles at the Sacred Garden of Maliko. Poinsettia Labyrinth at the Sacred Garden of Maliko. Holiday Buddha at the Sacred Garden of Maliko. A worthwhile reminder from The Sacred Garden of Maliko. for the Hui No'eau Arts Center. When I first moved to Maui several years ago, the only thing that made me feel remotely Christmas-y or holiday-spirited was the Christmas House at the Hui No'eau. I suspect much of my lack of good cheer had to do with not having family on this island and feeling like a social dweeb. I volunteered for Christmas House in early December and felt like my inner scrooge was almost transmuted into a jovial inner elf. Back in those days, the Hui No'eau called their annual holiday sale "Christmas House." There were bustling volunteers, shoppers, wreaths galore, upbeat holiday music, and many handmade items and fine art objects for sale. I felt useful and needed. Most years, I do try to volunteer for the Hui's December display, but this holiday season has been more challenging than most. Back in November, I was hopeful that I would get to help with setting up the "recycled holiday" display. I did manage to go through some household items to see if I had any objects that could be used in their display. The list of suggested items included surfboards, hard suitcases, chests, boxes, picture frames, beads, silk flowers, vases, and fabrics to be "repurposed" into holiday goodness. I dutifully dragged my small box of donations to the front desk at the Hui, and then dragged my feet some more getting around to visiting the finished holiday display. Between errands and this and that, every time I stopped by they were closed. The display is definitely intriguing and artsy. I looked around to see if I could recognize any of my previously owned items stuck in a corner somewhere, or on the horse's derriere. Nope. Maybe they all got taken to the trash. Art and trash are both in the eye of the beholder. There was a red display in the main room centered around a carousel horse. December 21st was the shortest day of the year. Sunset took place on or near 5:48 pm. Here's a picture from beautiful, sunny and dry Kihei, facing Kaho'olawe. DH and I escaped from rain clogged Haiku for the day. (Very short post today). High Speed Internet Agonies: Hawaiian Tel, Roadrunner, Clearwire? Updated as of 2/15/15 (scroll to the bottom). High speed, low speed or no speed. Haiku has been agonizingly slow internet wise the last couple of days for those of us who have a Hawaiian Tel DSL account. Although even Roadrunner has its outages now and then. First, we thought the wifi router was dying... We tested the computer by plugging it directly into the DSL box, and the internet was superfast. Ah, so it was the router. A frantic call to my favorite computer tech, Trip Hill to ask if he had an extra router. No such luck. I picked Trip's brains on what kind of router to buy. Meanwhile the connection trickled to nothing... and we watched the little starburst icon on the monitor spin around as if trying to load something that wasn't there. Photo credit: Archtypographie as posted in Flickr. With some additional text by me. So is it the router or is it something else? "Trip, could the modem itself be dying?" Yes, was his grim answer, even the modem can die after a few years, and so can routers. The connection was alternately super fast, then super slow, changing every few minutes. We plugged the wireless router back in, and it was fine off and on for a while. So maybe it's the DSL box. The first day, we called Hawaiian Tel and the operator knew nothing, but the wait time was one hour. We decided to go to bed, and then called Hawaiian Tel the next day. Again, a wait time of an hour. That was Tuesday morning. Hawaiian Tel finally called back and they admitted that one of their units in Haiku was malfunctioning, causing extremely erratic internet speeds and access. They didn't know when it would be fixed. A friend from work called later that afternoon and said she saw three Hawaiian Tel repair trucks on her way to Ulumalu Road, after passing Kauhikoa. Still no internet that night (Tuesday) and the next morning was still erratic. We escaped the rain yesterday and went to sunny, glorious Kihei to wring out our water logged bodies and dry out. Yes, there are darn good reasons to live in Kihei, which is why so many condos and hotels are there. Hawaiian Tel did call us back on the way to Kihei and said there was a broken unit in Haiku and it affected all of Haiku. The tech said it was the "D-slam" that was broken, whatever that was. There was no timeline on when it would be fixed. Finally, the internet is back up, after at least two full days. So, it wasn't the router, and it was Hawaiian Tel. If you need faster internet service, then go with Roadrunner (Oceanic Cable). But keep in mind it does have outages. Before the major Hawaiian Tel outage a week ago, Trip would have said that Hawaiian Tel is the more reliable service, albeit not as fast. But it's functional for most people. If you need less expensive internet service, then go with Hawaiian Tel, which has been acting up this month. If you need internet all the time, and cannot tolerate any disruption in service, get an account with both companies. If Roadrunner goes down, Hawaiian Tel is your back up. Also, there are devices called mifis which are mobile hot spot devices. They work too but are not ideal, even if they're supposed to be 4G. By the way, Oceanic Cable is notoriously slow about repair jobs on this island, maybe because they don't have enough technicians. It's not uncommon to hear complaints of people waiting for two weeks to get internet installed here, or to get it fixed after a problem. Well, I didn't even ask Trip about Clearwire, but a friend has it and she admits it can get really slow too - especially when everyone is on netflix or hulu at the same time. Update 3/27/13: January of this year was another terrible month for internet, and there was erratic service throughout Maui and the rest of the state, due to issues with Oceanic Cable. If it's not one company, it's another. Even major hotels have slow internet from time to time. Some people even resort to mifis when the regular service goes out. Also is there 4G service on Maui? Ha! Supposedly there is, but in reality, there isn't. Who knows? It may happen this year. Update 1/7/15: Many visitors in Kihei, the beautiful sunny south side of Maui, have been complaining about grindingly slow and erratic internet since December. What's going on? Apparently, Oceanic Cable, one of the two major high speed internet providers, does not have enough infrastructure to support the extensive internet use during high season. High season is the peak tourist season, when most visitors come to Maui. Update 2/15/15: Even the University of Hawaii now thinks that Maui has ridiculously slow internet speeds. 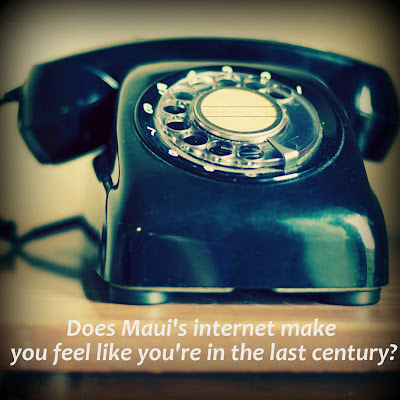 Maui County is now doing a study on Maui's crappy internet. Bird poop tomatoes are tomatoes that grow wild here, and seem to flourish in the cooler weather when there is plenty of rainfall, like now. A friend dubbed them "bird poop" tomatoes because birds eat the tomatoes, although I've never seen this in real life, and poop out the seeds during flight. When there's a good rain, these tomato plants pop up all over the place. They are like regular tomatoes in being vine-y and straggly and running amok. But their leaves seem to be more resistant to the tomato diseases we get here, like powdery mildew, which makes many tomato leaves turn whitish and shrivel up. Tomatoes are uncommonly difficult to grow here on Maui. They require some real effort to get a good crop, and the fruit flies also like to sting tomatoes. It's a shame bird poop tomatoes are so small (about 1/2" in diameter) for the size of the plant. But I don't mind letting the tomatoes grow if I don't have anything better growing, and they are intensely tasty. But it's definitely not a productive use of garden space! On the other hand, if there were no gardeners on Maui and no access to garden variety tomato seeds, bird poop tomatoes would be the only ones growing. Actually, poinsettia "blossoms" are not really blossoms - they are leaves that change color, especially in December approaching the Winter Solstice. The only gardening tip I heard regarding poinsettias is that they don't like to change color if they receive too much light at night. Maui is abundant with blooming poinsettias at this time of year. Many unassuming front yards burst into bloom. Another variety of poinsettia, with small "flowers." A closer look at the "blossoms"
This is a variety of poinsettia that I know from childhood. It's not the nursery variety sold in stores, and makes a huge bush outside. The flower is actually very tiny and in the center of what we think of as the "flower." Poinsettias are members of the Euphorbiacae family. The milky sap from a broken stem is poisonous. Look, but don't touch. Here's a more traditionally colored poinsettia. It may have started as a small nursery plant but is pretty darn happy growing outside on Maui - just like many other bugs, critters, and plants that love Maui! Another poinsettia (towards the end of its bloom season in late December) with Spanish moss growing underneath.